Let’s have a brief look at the regions were we can expect to find wild flowers, and then I’ll describe some special places that I have visited and what I found of interest. I’ll start with the larger region of Chania, called the prefecture of Chania. Crete is divided into four prefectures (called Nomos, these four are Chania, Rethymnon, Heraklion and Lassithi) and every prefecture is divided in some districts which are divided in many municipalities, which include several towns and villages. A map of the municipalities can be found at: http://www.chania.gr/map.jsp?lang=en. The prefecture of Lassithi is in some botanical books called Sitia. The prefecture of Chania is divided in five districts ( or provinces, these are Kydonia, Kissamos and Apokoronas in the North and Selino and Sfakia in the South) who are divided into 25 municipalities (http://www.chaniacrete.gr/maps/chania_big-en.gif and http://www.interkriti.gr/ ). The western part of Crete is much greener than the eastern site, which is more dry and some parts indeed look like a moonscape (like the slopes of mount Psiloritis). Therefore more flowers can be found, sometimes in great numbers in the west of Crete, that is: Chania. ​The district of Kydonia includes the city of Chania, Souda and the peninsula of Akrotiri in the east and Maleme to the west and to the White Mountains (or Lefka Ori) in the south. Its southern border runs through the middle of the White Mountains, which have more than 30 summits with a height over 2000m. The highest summit, Pachnes is only 3 meters lower than Psiloritis (central Crete) at 2453m. The three northern districts consist of fertile lowlands and hills. The coastal zone is one endless sandy beach where tourist activities are concentrated. The two districts in the south of the prefecture of Chania (Selinou and Sfakia) are different from the three northern provinces. There are only few small sandy beaches, the mountains ending abruptly in the sea. 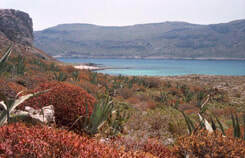 The vegetation is drier, although Selinou consist of many fertile hills with mainly olive trees. 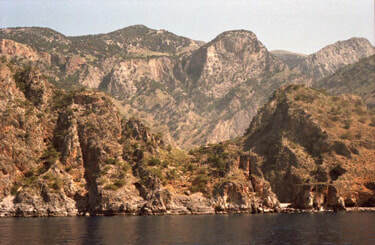 The mountains of Sfakia are cut by several deep gorges (Samaria, Imbros and many other) which run from north to south, to the Libyan sea. 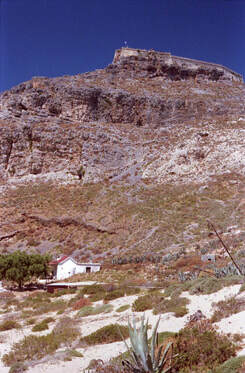 Sfakia is, because of its isolated and mountainous character, the most unspoiled and also very traditional. ​Culturally, Crete (and especially Chania) has always been situated on the crossroads of civilizations and in many ways acts as a bridge between the countries of Western Europe, the Near East and Africa. You’ll find remnants of the Minoan civilization, the Romans, the Francs, the Venetians, the Turks, yes even from the Egyptians and, more recently, from the Germans. 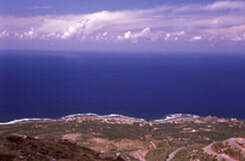 The coastal zone of Kydonia and Kissamos is the main touristic area of West Crete. 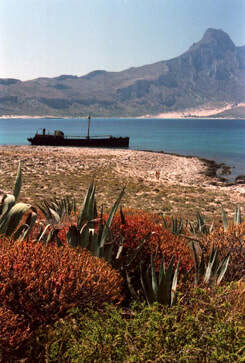 It has a long sandy beach stretching to the peninsula of Rodopou. This has encouraged the touristic development and you’ll find long lines of hotels, apartments, restaurants, travel agent, car rentals and other tourist offices. (This is a place that I try to avoid as much as possible.) I prefer to leave the coastal area and move inland, there you’ll find a whole different scene, an agricultural countryside where the main crops are citrus (mainly oranges and lemons), but you can also meet Kiwi, Avocado, Banana, Mango, Kumquat, Cactus and several others, and, in the higher and drier hills, olive trees. Here you can also find many chestnut trees and platanes. And flowers everywhere, along the roads, in the orchards, in the fallow fields. The area is particularly beautiful in the early spring. In the middle of Chania city, you’ll find the endemic Petromarula growing out of the old walls of the Arsenali. 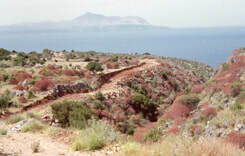 The peninsula of Akrotiri is situated immediately east of Chania and is known for a lots of flowers in spring. Villages here are Marathi, Kalathas and Stavros (where the beach scenes of Alexis Zorbas were filmed). Almost the year around you’ll find in this area a lot of flowers and not many tourists. Here is also The Park for the Preservation of Flora and Fauna ( see: http://www.park.tuc.gr/index_UK.php) from the Technical University of Crete. 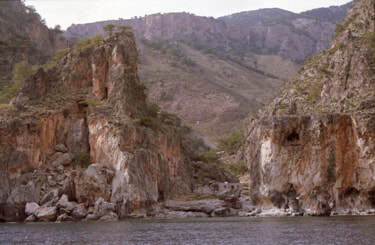 From June to October, hordes of tourists cross the Plateau of Omalos to that tourist attraction: the gorge of Samaria. 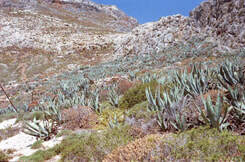 The plateau of Omalos is located at an altitude of about 1100m completely surrounded by mountains. From here you get a nice view into the gorge of Samaria, far below. The plateau and the surrounding mountains are full of flowers. ​In the section “Selected Regions” I give a description of special places, that you can use for excursions. I’ll try to show you how to get there, what you can expect to find there and I’ll give description of selected plants. New places will be added from time to time. After I visited a special place or region, it takes some time to organize my photographs, to search for information, to make a description and add a map. So please come back regularly.